In 1500 AD, the Aztec controlled most of what is now Mexico. People also called them the Mexica. In 1519, the Aztec ruler, Moctezuma the Younger, was surprised to hear that white men on ships had shown up out of nowhere. Moctezuma invited the strangers to his capital city, Tenochtitlan, as guests. He hoped they would help him fight his enemies. But instead they took the side of Moctezuma’s enemies and captured Moctezuma. This alliance besieged and conquered Tenochtitlan. They destroyed the Aztec central part of the city in 1521, and rebuilt it as their capital. Today it is Mexico City. 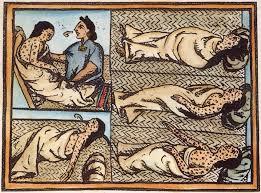 But millions of Mexicans were dying of diseases the Spanish brought with them: smallpox, measles, and dysentery. Mexico also got much poorer. Rich, powerful Spanish families took the profits from Mexican farms and mines and sent the money back to Spain. Many Mexican people learned to speak Spanish. Jesuit missionaries came to Mexico and convinced many Mexican people to become Catholics. What was going on in Spain? 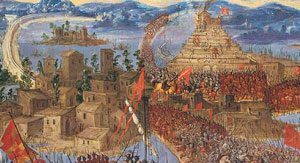 The Spanish encouraged Mexicans to become more Spanish by knocking down Aztec and Maya buildings and burning almost all of the Aztec and Maya books. But this destroyed Mexican culture. Many Spanish people came to live in Mexico. During the 1600s, Spain took over more land both north and south of Mexico. In the north, they conquered the Pueblo people and the Apache in Texas, some of the Ute and the Paiute, and the California natives as far north as Los Angeles and then San Francisco. So Spain ruled most of the American West. In the south, they took over all of Central America. In the 1700s, many Asian people also came, from China and the Philippines. By 1810, after Napoleon, Spain was not strong enough to hold on to its colonies anymore. Mexico started fighting for independence. General Santa Anna – a rich Spanish man living in Mexico – took control. 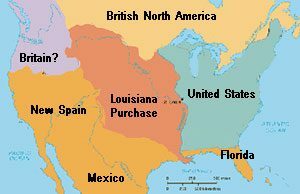 But after the Louisiana Purchase, English-speaking settlers from the United States started to take over Mexico’s northern land. In 1835 Texas broke away from Mexico. And by 1848 the United States army conquered Colorado, Utah, New Mexico, Arizona, and California too. By 1861, with colonization and various civil wars, and losing so much land, Mexico had gotten very poor. 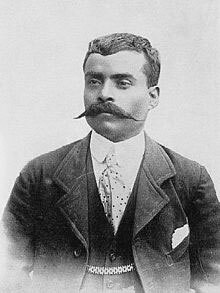 Mexico had borrowed so much money that their leader, a Zapotec man named Juarez, couldn’t pay Mexico’s debts to European countries. These countries – Britain, Spain, and France, sent armies to take over Mexico and force it to pay the money. Napoleon III of France put a new European emperor into power, the Austrian ruler Sophie‘s son Maximilian. The Mexicans hated Maximilian. They fought against him, and the French, in a great battle we celebrate with the Cinco de Mayo holiday. Once the United States was done fighting the Civil War, the U.S. army came and forced the French out of Mexico. Then the Mexicans killed Maximilian. The new government did manage to help out poor people more. They built big hydro-electric dams. But they didn’t really let people vote for their leaders. The leaders were always the same group of people, the PRI. And Native Mexicans, especially in Chiapas in southern Mexico, were still much poorer than whiter Mexicans. Chiapans kept fighting for their rights. In 1997, Mexico finally had a real democratic election, and different people took charge. They didn’t succeed very well, though. So today Mexico’s President, Enrique Nieto, is again a PRI member. And the Native people keep fighting to get equal treatment. Cite this page: Carr, K.E. Mexico and colonization – American history. Quatr.us Study Guides, September 8, 2017. Web. April 23, 2019.